Western blot analysis of HEK293 cell lysate probed with Mouse anti p53 (aa20-25) (MCA1703) followed by HRP conjugated Goat anti Mouse IgG, visualized using chemiluminescence. Formalin fixed, paraffin processed human breast carcinoma stained with Mouse anti p53 (MCA1703). 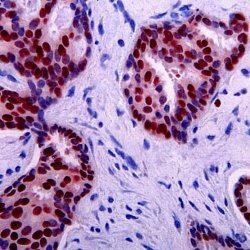 Mouse anti p53 antibody, clone DO-7 recognizes the human 53 kDa p53 tumour suppressor protein, also known as Cellular tumor antigen p53 or Antigen NY-CO-13, encoded by the TP53 gene. p53 is a 393 amino acid protein with an N-terminal transactivation domain, followed by a proline-rich region and a DNA binding domain in the central core region. The C-terminal region contains a tetramirization domain and a terminal regulatory domain (Joerger et al. 2010, Bai et al. 2006). Mouse anti p53 antibody, clone DO-7 recognizes an epitope at the N-terminal end of p53 between amino acids 20-25, binding to both wild type and mutant forms. Clone DO-7 is not expected to recognize the multiple isoforms lacking the N-teminal region. Spleen cells from immunised BALB/c mice were fused with cells of the mouse X63Ag8.653 myeloma cell line. Vojtĕsek, B. et al. (1992) An immunochemical analysis of the human nuclear phosphoprotein p53. New monoclonal antibodies and epitope mapping using recombinant p53. J Immunol Methods. 151 (1-2): 237-44. Bonsing, B. A. et al (1997) Specificity of seven monoclonal antibodies against p53 evaluated with Western blotting, immunohistochemistry, confocal laser scanning microscopy, and flow cytometry. Huang, H.Y. et al. (2008) Immunohistochemical and biogenetic features of diffuse-type tenosynovial giant cell tumors: the potential roles of cyclin A, P53, and deletion of 15q in sarcomatous transformation. Clin Cancer Res. 14: 6023-32. Xinarianos, G. et al. (2002) p53 status correlates with the differential expression of the DNA mismatch repair protein MSH2 in non-small cell lung carcinoma. Int J Cancer. 101: 248-52. Lin, L.C. et al. (2006) p53 and p27 as predictors of clinical outcome for rectal-cancer patients receiving neoadjuvant therapy.